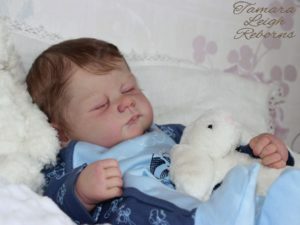 This cute reborn baby for sale has been created using the April sculpt. I just love the expression on her face. 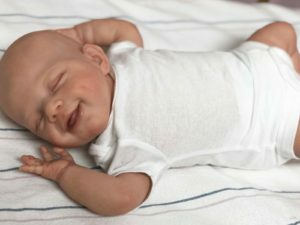 I am not the artist for this baby. Details have come from her ebay listing. 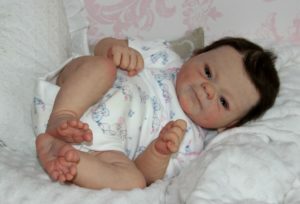 This is Reborn April she is limited edition. 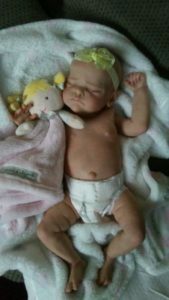 She is 20 inches long and weighs close to 7lbs. She looks like a bigger baby in pictures but she is 20 inches long. April has full arms and legs, and a doe suede body. She has been painted with GHSP and has blushing mottling and subtle veining. Her head body and limbs have been weighted with fine glass beads and angel soft polyfill. 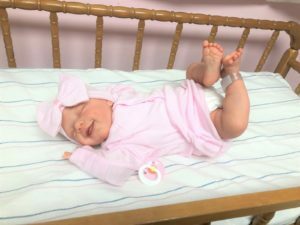 She has a ring on her legs and head for easy turning and plugs in all her limbs and head. She is baby powder scented. 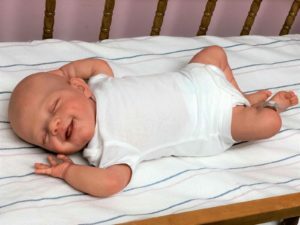 She is a Caucasian baby. She is bald with rooted eyelashes. She has a magnet for pacifiers (pacifiers don’t seem to hold as well because of her mouth being open) and a magnet on the left and right and middle of her head for bows. Her nails have been tipped and glossed. Inside her nose and lips and inside mouth have been glossed to give that wet look. She has a rough texture to her skin from being sealed (this is to protect the paint). She has a bobo on her right foot some of her toes have little red spots on the back of them (shown in the last picture ). 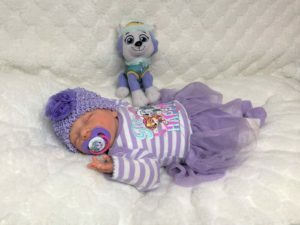 She will go home with the hospital gown and hat, hospital band, the paw patrol outfit with matching pacifier and the hat and the headband and the bow and the matching bottle, the first impressions pink outfit with matching headband. Pictures may be lighter or darker.